In today’s world, preoccupied with talk of “a new Cold War” between major powers, the events of half a century ago in a European country far from the U.S. may seem of little relevance. But for those who want to understand how a different – a socialist – world can be created, it is well worth looking at the “events” of May 1968 in France as Clare Doyle, member of the International Secretariat of the Committee for a Workers International, explains. In those days, there was a Cold War, but it was one between two very different social systems. The economies of the “West” were capitalist – based on private ownership and profit. In the “East” they were state-owned, bureaucratically-run, claiming to be “socialist” but excluding workers, sometimes brutally, from any decision-making – at work or in society. On both sides of the “iron curtain” the fear of “mutually assured destruction” stayed the hands of the nuclear powers. But capitalist and Stalinist regimes alike feared a revolution anywhere that would put power firmly in the hands of democratically elected representatives of the working class. In France in May 1968, such a revolution was entirely possible and would have spread like wildfire, across Europe – West and East. It could have leapt across the Atlantic (and the Pacific) to the U.S. where the dry kindling for such a conflagration was accumulating in the antiwar, black freedom, and women’s movements which also contributed to a massive wave of working class unrest. In Europe, after World War II, there had been a rapid increase in production, particularly in industry, but many workers were living in slums and earning wages that did not allow them to buy the very cars, washing machines, fridges, and cookers that they were producing. In France, the Fifth Republic established by General de Gaulle in 1958 was based on a “strong state” which had (and still has) dictatorial powers to over-rule parliament when the president deems it necessary and to call troops onto the street. Students were beginning to express their own dissatisfactions – about over-crowded lecture halls, outmoded rules and regulations the war in Vietnam and apartheid in South Africa. Their protests – those inside the universities, with sit-ins and round-the-clock debates and those outside on the streets – were brutally attacked by the forces of the state, including the hated semi-militarized CRS. University campuses were closed. Some student leaders were taken to court and imprisoned. Hundreds were arrested, thousands were beaten and bloodied on the demonstrations, hundreds were hospitalized. The ruling layer – the government in particular – was split over whether to carry on with repression or make concessions. This is a typical feature of any developing revolutionary situation. 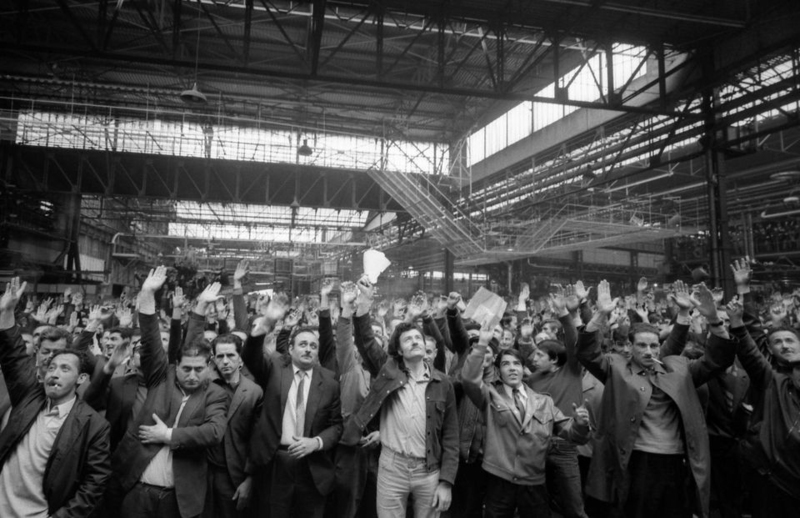 In Paris, at the beginning of May 1968, concessions actually emboldened the students. More demonstrations saw more injuries and more sympathy from the middle layers in society. The leaders of the sizeable “Communist” Party of France began by condemning the students as anarchists, Trotskyists, and Maoists “playing at revolution.” But pressure building up from below for solidarity action with the students forced the CP-led trade union federation, the CGT, along with the more “moderate” CFDT and also the lecturers’ union, the FEN, to call a 24-hour general strike for Monday, May 13. This was the only official call for strike action in France throughout the “month of revolution” and yet the movement that developed became the most powerful general strike in history. On that day, more than five million workers came out on strike. One million demonstrated on the streets of Paris and tens of thousands in other cities across France. The trade union leaders hoped this would act like the valve on a pressure cooker and that workers would bow once more under the yoke of capitalist exploitation. Far from it! A few workers in one factory – Sud Aviation in Nantes – decided to stay on strike and occupy their factory. They set the ball rolling. Workforce after workforce followed suit – striking and occupying auto plants, shipyards, hospitals, coal mines, transport depots, and post offices. Schools, shops, hospitals, offices, theaters are occupied. Farm workers begin sit-ins at farms and depots and their unions call for a national demonstration on May 24. On the May 18, there was near paralysis in the country and the fascist organization, Occident, can muster no more than 2,000 for a demonstration aimed at breaking the strike! By Monday, May 20, six million were on strike and occupying their workplaces, setting up committees for conducting the strike and organizing rotations for looking after machinery and equipment. In some cases, they locked bosses in their offices and fed them by buckets lowered through the skylights. Everywhere red flags were hoisted and the Internationale, the famous workers’ hymn, was sung. Outside some factories effigies of the bosses were dangling from scaffolds! Lawyers, architects, civil servants, teachers, soccer players, bank-workers, department store workers, and workers at nuclear power stations were all getting involved. As at the time of the great sit-in strikes of 1936, even the dancers of the Folies Bergeres joined in, complaining about their working conditions and dreaming of a different life! The Cannes film festival was cancelled, state radio and TV workers took control over programs and news and even professional soccer players went on strike. Ports are paralyzed, sailors and police begin to mutiny. White collar workers at the headquarters of the bosses’ organization (the CNPF) occupied the board-room. Committees everywhere discuss how a future society will work, often in terms of socialist or communist democracy. The major workers’ party, the pro-Stalinist Communist Party, is riven with tensions as it tries to hold the line, declaring this is not a political strike. By Friday, May 24, 10 million – more than half of France’s total workforce – were on strike. Violent battles raged on the streets of Paris where barricades had been built for the first time since the liberation struggle against German fascist occupation at the end of World War II. On May 25, tripartite talks begin between De Gaulle’s government, the bosses, and the trade union leaders … who are still insisting that the struggle is not political! After three days and nights of talks, a very generous package of reforms is agreed – on wages, holidays, working time etc. These reforms were the product of revolutionary events but were not enough to quench the thirst of the millions of workers occupying their workplaces. The next day, at the giant car factories and elsewhere, when the union leaders present them, they are unceremoniously rejected. Workers are striving for something else, as yet unarticulated by any of their “traditional” leaders. But the workers’ leaders have no program for taking the power that is lying in the streets. Those who have an idea of what is needed do not have a stong enough voice. Workers wait for an alternative program of action from the “communists” but nothing is forthcoming. Later, the CP leaders will say the state was too strong, but the state was already disintegrating. A classical situation of dual power existed: a revolutionary situation with the ruling layer in tatters, the middle class on the side of the working class and adopting its methods of struggle – occupations, demonstrations – and the working class on the move and ready for a fight to the finish. Workers in neighboring countries had already shown their solidarity in action as well as words – refusing to do the work of the striking French workers such as printing government material, moving goods in or out of the country etc. So what could a revolutionary leadership with a mass base of support have done to complete the revolution in France in May 1968? The idea of linking up the strike committees on a local, regional and national level to form an alternative government was put forward by people whose voice was too small, who lacked a base in the workers’ movement. The “Trotskyists” of the Fourth International, with whom the Militant (forerunner of the Socialist Party in England and Wales, sister organization of Socialist Alternative in the U.S.) had broken in 1965, turned their backs on the working class, saying they would not move into action for at least 20 years. In France, they concentrated on the student movement and elsewhere on the revolt against colonial rule. When one of their leaders, Ernest Mandel, voiced this opinion in London at a public meeting in the Spring of 1968 – just one month before the May explosion – he was challenged by Militant’s editor, Peter Taaffe, insisting it would not be long before the workers of France, with their revolutionary traditions, would be on the move again! In the early days of the “events” themselves, he pointed out to a meeting in the London School of Economics, that a sure sign that a revolution was in the making was the 12 and 13 year olds trying to join the demonstrations and teachers locking them in their classrooms…until they themselves went on strike! “France is the country in which the class struggle is fought to a conclusion,” said Marx’s great co-thinker, Friedrich Engels. The situation was rotten-ripe for a revolutionary take-over and examples had developed of joint strike committees of workers, students, and small farmers taking over from the old state forces. In Nantes, the home of Sud Aviation, where the strike originally took off, such a committee was formed early on in the movement. It took control in the region of Loire Atlantique over every aspect of society – production, distribution, and exchange. Food was brought into the towns by the small farmers, prices and fares were held down, the police were made redundant by students and workers patrolling the neighborhoods, and other areas were urged to follow suit. If similar representative bodies had developed in every region of France and sent elected delegates on to a national council, committees of struggle would have become organs of workers’ rule. As in Russia in October 1917, a trusted revolutionary leadership would have taken all the necessary measures to bring the bulk of the existing state forces over to the side of a socialist government. They would have made an appeal to the workers of every other country to follow suit and paralyzed the possibility of a military intervention from outside. But the leaders of the major union federations and of the Communist Party were the ones who least wanted a successful revolution. If workers could take power in a developed industrial economy, they knew, it would inspire the workers of the Soviet Union to throw the parasitic bureaucracy off their backs and reconstruct genuine workers’ democracy – the Cold War would have melted away like snow under the sun’s rays! They literally betrayed it. The leaders urged workers to return to work but more workers actually joined the strike, searching for a way of changing society forever. But no lead was given by the political forces they knew. De Gaulle returned to France, calling an immediate election and mobilizing the forces of reaction onto the streets. The police and army moved in against strikers and left organizations. Hundreds of militant workers were fired, a number of left organizations were outlawed. In the June parliamentary election, the Gaullists gained and the Communist Party lost votes – standing, not for a new socialist society, but “law and order.” Yet within a year De Gaulle was gone, replaced by Georges Pompidou – like the French president today, a former Rothschild banker. The initial gains from the tripartite agreement were undermined by inflation and the continuation of capitalist exploitation in general. But the trade unions grew in numbers and in 1969 various socialist forces came together to launch a new Socialist Party. Francois Mitterand became its leader in 1972 and in less than a decade was elected president of the country. The same year, 1981, the Socialist Party was voted into government by a massive 55% of the electorate. Without an all-out program of nationalization and democratic workers’ control and management, even a “socialist” government by name will end up implementing policies in the interests of the 1% – the capitalist class. This was the lesson of the Mitterand government and of the more recent government of Francois Hollande and his “Socialist Party” which was driven from office last year with a massive collapse of the SP vote. Today, France is embroiled in a new contest between the classes. Emmanuel Macron is determined to push through a program of anti-working class “reforms.” The workers and the youth of France are determined to fight it. Railworkers are striking to prevent privatization of the railways and attacks on their wages and conditions. Students in schools and universities are fighting a system of selection aimed at excluding children from working-class backgrounds. Days of action see millions of workers and young people striking and demonstrating together. A new ‘68 is in the air, but it could yet be dissipated by a failure of the trade union leaders and of popular left figures like Jean-Luc Mélenchon and Olivier Besancenot to mobilize for a fight to the finish. History never repeats itself exactly and time is needed to build a leadership that is capable of leading the flood of revolution on to victory. Discontent, even anger, is everywhere in today’s world – not least in the U.S. where school students and workers have been demonstrating a new militancy against the injustices of a very ugly capitalist world. A look at the greatest general strike in history can inspire in a new generation the confidence that socialism can be won, not just in one country – wherever it breaks out first – but worldwide. History has lessons for all of us if we take a little time to look at it. The conclusion? “We are many, they are few!” A socialist world is possible! Next articleSOCIALISTAS DEMOCRÁTICOS DE AMÉRICA (DSA): ¡HAY QUE IMPULSAR POTENTES CAMPAÑAS INDEPENDIENTES PARA CONSTRUIR LA IZQUIERDA EN 2018!